UNESCO inspectors’ report demands the council review the whole Caltongate development according to The Scotsman. UNESCO inspectors are reportedly demanding a reprieve for two listed buildings threatened with demolition, removal of the new building on Jeffrey Street, and a full review of how the development would impact on views from Calton Hill. With the developer in administration the city council is now under intense pressure to react, as they retain ownership of the land designated for the hotel. – creation of a buffer zone around the current world heritage site. – clear policies in relation to height controls on the basis of key views and vistas from within and outside the property. Whatever view you have on the controversial Caltongate development the task ahead for this site is huge. Over the last year I’ve had a good look at it from all sides and from places like Calton Hill. What is clear is that there is a massive scar on the Old Town that needs patching. The historic Old Town is perilously thin at this point, with just one row of buildings along the north side of the High Street. We reported 4 Apr on the Taskforce, led by Save Our Old Town, set up to rejuvenate empty buildings and landscape vacant space left by the collapse of developers Mountgrange, and naturally that is welcome, but the huge swathe of empty site has to be the main focus. There is an argument for speed but of course a counter-argument to take plenty of time to get this right, an unfortunate position for the city to be in. Previous views expressed have argued for a patina appropriate to the historic Old Town, and I’ve held up Canongate South (aka Holyrood North), with the caveat that density and quality of buildings onto Holyrood Road don’t live up to a benchmark for the city. However, the streetscape, density, mix of old and new, and general quality of buildings [on the north part of the site, ie adj. Caongate] from A+DS to the Scottish Poetry Library is good, worthy of a benchmark for new development in the Old Town. There is a glaring problem though – where the ugly New Street Bus Station once stood there is no context within the site. In my experience, lack of context is one of the issues that makes architects struggle more than any other, and therefore this site would present a challenge in my view to all architects whether traditional or contemporary in view. But this issue provides further reason (not that it’s required) to retain the listed buildings on the site. 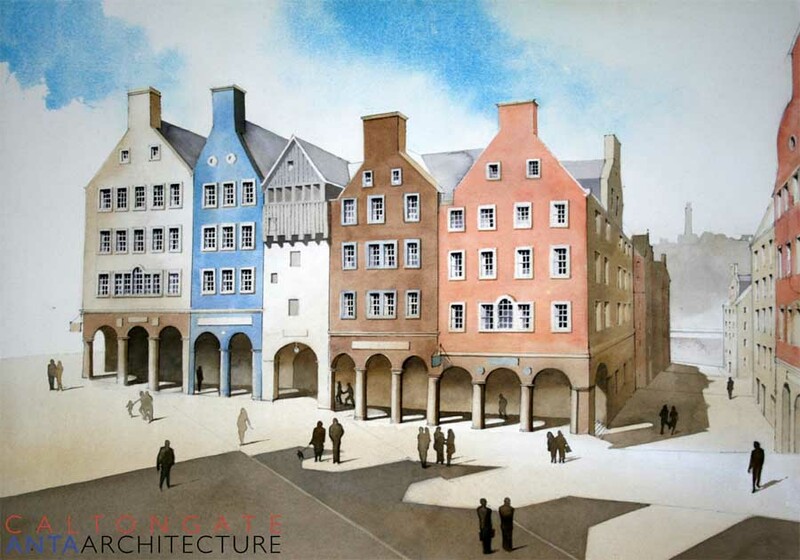 It is surely possible, just like at Canongate South, for new buildings to work cheek by jowl with the old ones. Bearing in mind the reignited ‘Prince Charles’ debate – loosely summarised as being about architects’ responsibility and the perceived conflict of old and new – you can look round the Old Town and find so many horrors from the last fifty years that it is no wonder that so much of the public has lost its trust in architects and developers. Witness many of the buildings on Holyrood Road, the hotel on St Mary Street and the Jurys Inn, all of which don’t work with the grain + scale of the Old Town. On recent visits to Leeds, Amsterdam and Copenhagen I’ve been struck by how successful the core of their city centres is. In Leeds for example the streetlife is bustling around the Victoria Quarter area with a wide range of people. Pedestrianisation within appropriately scaled streets has been popular. In Edinburgh the central section of the Royal Mile and St Andrew Square are the only large spaces in the active city (ie not Princes Street Gardens, etc.) where you get a combination of activity and movement unhindered by vehicles. Canongate South has the free movement but not the bustling activity, if anything Caltongate could do better. Certainly there should be nothing like the disasters of Festival Square and Conference Square. I remember doing a talk for the Cockburn Association about eight years ago on the myriad deficiencies of The Exchange and lots of feedback on recent tours for the BCO conference (at the EICC) backed up my firm view that these large windswept spaces are not popular and don’t work. In May the masterplanner for The Exchange hosted an event titled the ‘Festival of Place Making’, how ironic. Edinburgh needs buildings and streetscape that integrate with the historic cores, that work at a human scale. Style is not an issue, quality is. A confident European capital should be relaxed enough to have a range of styles on a large site like this, using a range of good architects. A return to the drawing board at Caltongate therefore represents an opportunity to restore and continue the patina of the Old Town. But it won’t be easy. It is hard to understand why Malcolm Fraser, writing in the Scotsman on Wednesday 1st April (sic!) believes that the so-called Caltongate project would be good for Edinburgh’s Old Town. His community credentials, his concern for the city and his track record in creating beautiful small buildings – Dancebase and the Poetry Library in particular – are well known. He listened, spoke moderately and was well-received at a constructive meeting of the Save Our Old Town (SOOT) group on Wednesday evening. Yet very few who care for the history, the architecture, the image and the long term health of Edinburgh could fail to welcome the collapse of the Caltongate developer, Mountgrange. One may feel sorry for the individuals and the firms – including Malcolm Fraser’s – directly affected, of course, and no-one welcomes a delay in creating 2000 jobs and 200 homes: but the repetition of figures of this sort misses the point. Everybody wishes to see the site of the old New Street bus garage developed, and any development will build houses and generate employment. 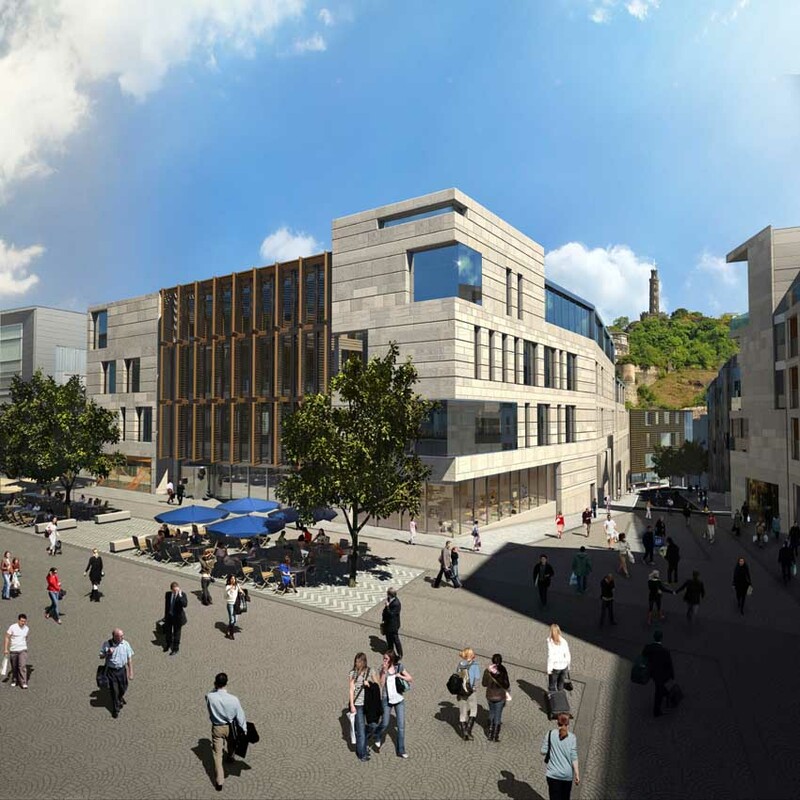 The point is that this is a bad scheme, which will devalue the north back of the Canongate for generations to come. It may yet proceed, but the drastically changed development climate creates the opportunity to consider alternatives. History shows that times of high economic pressure are bad for historic cities. A previous boom gave us the St James’ Centre and only huge efforts by the conservation lobby saved Edinburgh from an urban motorway. I was involved myself in saving West Nicolson Street and in flying a balloon to demonstrate the height of a tower block proposed at Haymarket in the early 70s! Have we forgotten the efforts of civilised architects like Sir Robert Matthew and Sir James Dunbar-Nasmith, of campaigners like Eleanor Robertson, Colin McWilliam and Oliver Barratt, and of Desmond Hodges and Jim Johnson in the New and Old Towns respectively? These were the people who brought international recognition to Scotland’s capital, and who secured its place as one of the great cities of the world. As a wise financier wrote recently: recessions are necessary evils: they clean out bad money, bad practice and bad behaviour. However reluctantly, we must recognise the necessity of this recession. Sound principles for development in historic cities were first laid down in the early 20thC by Sir Patrick Geddes, pioneer town planner and father of urban conservation. Geddes believed that cities were living organisms and, in his theory of “conservative surgery” argued that change in established settlements should, whenever possible, be small and incremental. This lesson was painfully re-learned after the 1960s fashion for slum clearance and comprehensive redevelopment. As recently as the 1990s in Edinburgh, all seemed to be well. The development of the area to the south of the Canongate, master-planned by John Hope and which included The Tun and Malcolm Fraser’s Poetry Library, was a model of Geddesian principle: the grain of the plan and the existing buildings were retained, new buildings were inserted, and what a success it is! Why, oh why, was all this understanding and experience forgotten and ignored on the north side, at New Street? The answer seems to lie in commercial opportunism, the overweening ambition of the City Council itself at the time to play the development game, to change the very nature of the city to enable it to ‘compete’ with other cities in some sort of economic race. It is hard not to make comparisons in this with the behaviour of our Scottish banks. The New Street site – once the site of a gas works, of which Sir Walter Scott was a director and which had the tallest chimney in Europe! – was already a large one. Yet the City Council, completely forgetting Geddes, saw the opportunity to extend it to Jeffrey Street and to make it much larger by proposing the demolition of two listed buildings, one of which – the former New Street School – it owned. Why Historic Scotland acquiesced in this is hard to comprehend. The result was a scheme which disrupted the grain of the historic burgh and the topography of the north slope, demolished several good buildings including occupied houses and introduced commercial uses and architecture which was vehemently disliked by almost all but the architects themselves. At its meeting on Wednesday evening, SOOT initiated the establishment of an Old Town Development Trust (OTDT) which intends to open discussions with the City Council, with a view to bringing the existing buildings on the site back into use as soon as possible, temporarily landscaping the main part of the site and developing new proposals for the incremental development of the site for a mixture of uses, including more houses. This may be what the citizens and all those who care for Edinburgh as one of the great cities of the world – including, perhaps, Malcolm Fraser – actually want! James Simpson is an Edinburgh architect, a member of the Historic Environment Advisory Council for Scotland (HEACS) and a Vice-President of ICOMOS-UK. The collapse of Mountgrange Capital, the developer behind the Edinburgh Old Town “Caltongate” project, following the withdrawal of funding by their bankers, Lloyds TSB/HBOS, provokes contrasting reactions. Tonight will highlight the reaction of the anti-Caltongate “Save Our Old Town” (SOOT) group of locals and conservationists, who have campaigned against what they have claimed would “destroy Edinburgh”. They are holding – by coincidence I think – their AGM, at Old St Pauls Church in the Old Town, this evening. My practice is one of Caltongate’s architects, for a small but important corner of the site at Jeffrey Street, and I’m going along to the meeting – with some trepidation, as I’ve been regularly pilloried by them. I’d like to raise some other reactions to the development’s current problems. First might be the thought that, in a plunging recession, with hundreds of thousands of people losing their jobs and homes, the creation of up to two thousand jobs and around 200 homes, 40 of which were to be “affordable”, is an odd sort of destruction, and its postponement an odd sort of victory, even for individuals who promoted their campaign with “Let’s hope for a long and bloody battle”. The “scale and mix” of the proposals has infuriated them. Yet I am writing this in my office little more than 100 yards from the site, in a towering 10-storey ”traditional” Old Town building, part of the comprehensive redevelopment around North Bridge that included offices, a luxury hotel, upmarket shops and luxury flats – an almost identical programme to Caltongate, though minus the affordable homes and twice as high. Local worthies like Ricky Demarco, who would happily parade abroad in a luxury hotel, believe that for Edinburgh to welcome tourists here in a new one is, somehow, a capitalist outrage. Oddest of all is the reaction of Ian Begg, architect of the 8-and-9-storey luxury SAS Radison (nee Scandic Crowne) Hotel nearby on the High Street, built in a shortbread-tin-pastiche style which is proscribed by UNESCO and that obliterated three hugely-historic closes with its vast bulk. He was praised for attacking the “scale and style” of Caltongate’s 6-and-7-storey luxury hotel, with its respectful modern architecture set within the site’s recreation of closes. SOOT’s alternative mix leads with affordable housing and Farmers’ Markets. All regeneration needs to balance public and private investment, and in a climate where Scotland has hugely-underprivileged communities in desperate need of public assistance, the idea that we should spurn private investment keen to regenerate the Canongate, to divert public money into it, is pure Brigadoon. Caltongate will demolish two C-listed buildings and some other structures. We are learning to take much more care with the buildings of the past than our forebears did, but we might still note that this is the least demolition any major redevelopment of the Old Town has ever seen. My practice had been asked whether we would consider demolishing one of them – the Canongate Venue, a Victorian former-school – and said no. It has a solidity, craft and integrity that we no longer achieve today. Nevertheless it sits alien and awkward in the Old Town close pattern and we recognise that the characteristic fishbone urban structure, that is of international significance, is strengthened by its replacement. Overall there are things on the main site my practice would have done differently – but then there always is, what architect would not feel that? What is indisputable is that the proposals were vastly improved during the Planning process – and are hugely better than schemes previously granted permission for the site. My practice’s site is on the corner of Jeffrey Street, on the small car park opposite the new Council headquarters. Some Edinburgh people will remember the pedestrian bridge that, till the mid-60s, sprung from Jeffrey Street and accessed and crossed Waverley Station, to join the end of Calton Road at Leith Street. It preserved the route of the old Leith Wynd, the main road north out of Edinburgh for at least 1200 years (an original northern tail of the Roman Dere Street) until the building of the first North Bridge. Leith Wynd was lined by tall tenements, up to 6 stories, that framed the view north, of Calton Hill. We are reintroducing the start of Leith Wynd (with the hope that the rest might follow) and the framing of the view, and the mediaeval bustle and density that the Victorian builders of Jeffrey Street demolished. SOOT, the Cockburn Association and others are furious with us – apparently we should hang our heads in shame! What has happened to the Heritage Lobby when it works-up such a blind rage, that it fights against mediaeval urban bustle, and ends-up supporting demolition (whether Victorian or modern is irrelevant), car parks and the rubbing-out of ancient routes? I have campaigned for Edinburgh all my life, and my practice has rescued and renewed a great many historic buildings within the city and carefully woven new ones amongst them, as we intend to do here. I hugely admire the vigour and local advocacy of the campaign, and hope to play some part in persuading the community that private development is not only inevitable but desirable, and that their advocacy is more effective shorn of unhealthy rage. The developers Mountgrange Capital have gone into administration.